I found a bunch of scraps of cardboard left over from other activities and some glue-pens, markers etc. and some stickers. I didn’t have much to choose from sticker wise but I found sea animals and flowers so I thought I could make a page for the sea activity and a page for the garden activity. I also had some bows and butterflies etc. made for creating cards so I counted what I had of what and used that as the counting page since Hanlé has become really interested in counting as of late. Keep the book together as if it was stapled as you need the order of the pages to work out in the end. Now you can either Plot your pages and start working from the back, as it becomes difficult to write on the back of a page once you have glued layers of cardboard and bows on the other side (activity page). If you use glitter glue like me, you will also need to take those pages out to dry so doing the back first will save some time BUT if you are not going to use glitter glue and don’t mind a thick book, feel free to staple and start from the front, then you can write the activities on a separate piece of cardboard, cut it out with a nice pattern scissor and just glue it on the left sides to the backs of the activity pages. If you start from the back, write the activity on the left page and create your activity on the right… take note of the page that goes with it to the right as the order will be messed up once you take it apart for all the glitter glue to dry. 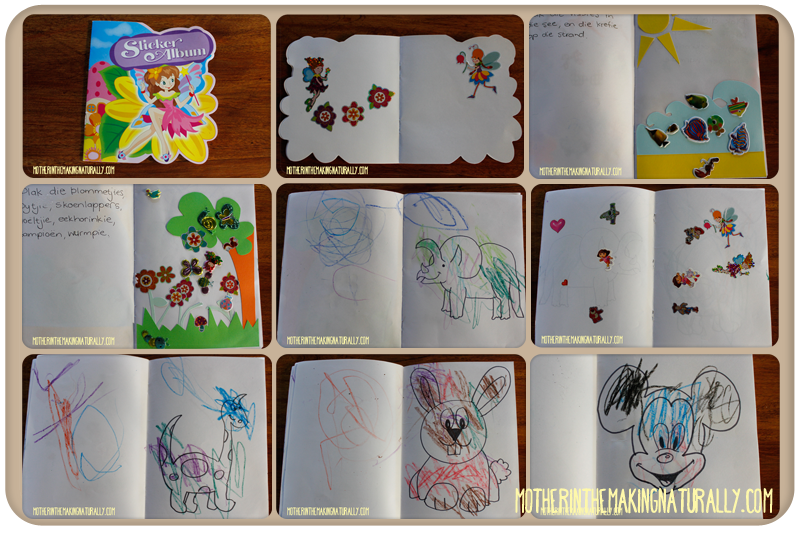 Draw a few coloring pages with open pages in between… its important for creativity to draw their own pictures too! Stick all the stickers that belong in a scene on one page of the sticker book and add some extra random stickers for free play. This is their book so they should have fun creative pages for themselves as well. If you are sending your toddler away with the book, remember to send the sticker book and some crayons to draw with.